Ah, a life on the open road. Some love it, some crave it, some would rather take the Lightning Rail and travel in comfort. Whoops, sorry, that was the last adventure. This time around, our intrepid adventurers are hot in pursuit of a missing secret agent along the trade roads to Trolanport. They at least have magebred horses, capable of running longer and harder, with supernatural powers of recovery, so they were reasonably confident that shadowing their target – at least until they got to a coach-house and found that they were much further behind than they expected. Their quarry was pulling sixteen hour days to their more leisurely eight, and was buying new horses to replace them every couple of days. A new travel scheme was quickly formulated, involving magical enhancement of their already formidable steeds, and some rough back of a trail ration calculations later the pursuit was really on – and so were the saddle sores. 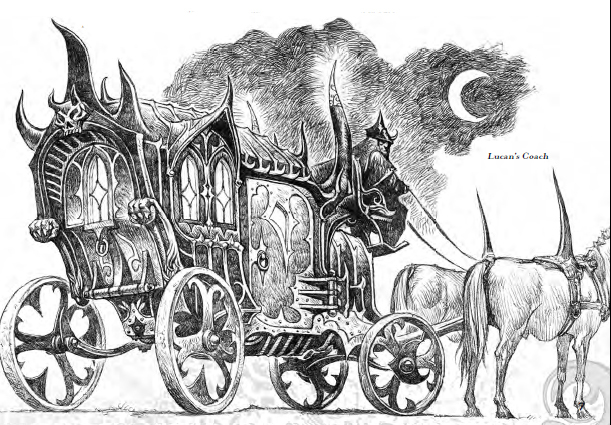 Now, there’s nothing suspicious about someone who rides in a coach like this is there? Fortunately, they were able to make up the time over the course of the week, sidestepping military patrols with their official papers and quickly despatching rogue monsters that happened on their campsite. When they saw the distinctly gothic-looking carriage a mile or so ahead of them they pressed on, hoping to catch up before they were spotted. When they’d narrowed that to around half that distance, the driver noticed they were closing in, and the real chase began. I’d worked out the relative speeds of the carriage and the horses, and laid out a very long map to simulate the players’ relative distances, and so they could plan their assault even as the distances between them narrowed. The driver of the coach, a woman tentatively identified as their quarry’s sister, was making plans of her own though. The first two rounds were spent casting protective magics on herself, and then, before the players were within effective striking range, she stood and started using spell scrolls, casting an enormous fireball smack in the middle of the adventurers. The bard seemed to catch the brunt of the impact, falling from his horse as he struggled to remain conscious. Fortunately the magical nature of their steeds seemed to protect them from the worst of the explosion, and with only minor wrangling, the party was able to maintain control of their horses and continue to close the gap, albeit with a widening gap between them to try and avoid the same thing happening again. This time, the driver unleashed a lightning bolt, catching the two druids. In response, Keil was able to cast a hold animal spell, but was unable to halt the carriage in its tracks. A slat was seen opening in the back of the cart, and then a pack of wolves poured out of the surrounding woods to harry the party. A desperate fight ensued, with Koff breaking free to close on the carriage just as Keil’s second spell attempt took hold, bringing it to a sudden swerving halt. A cloud of smoke plumed into the air and Koff threw burning oil into the carriage and the open coffin that remained within. The driver swiftly turned invisible while he was distracted, and then cast Fly to escape while the rest of the adventurers closed in and finished off the wolves. With their quarry airborne and presumably still headed for Trolanport, the party had no choice but to continue on their journey and begin looking for them in the bustling Gnomish city. The canals and waterways of the seaport at least gave them heart in that it would restrict the movements of their vampire target, and they spent most of their first day in the city restocking on supplies, asking questions in all the right places and researching the known weaknesses and powers of vampires. 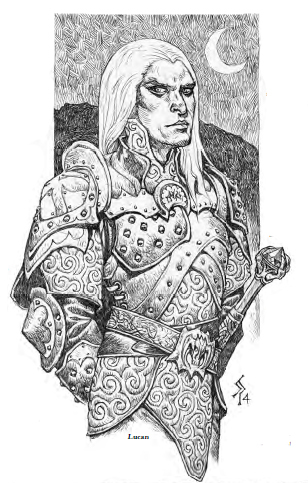 Aside from the brief excitement of an attempted mugging by a small group of sahaugin raiders, they were unable to find Lucan (a noted master of disguise) anywhere, but had identified a possible match for a name given by their employers as Lucan’s contact. The person identified in seized papers as ‘Krell’ seemed to be a high ranking diplomat in the Aundairian embassy called Neya ir’Krell. Of considerable interest within the city that day was that she was due to host a masked ball at the embassy that very evening, an hour after sunset.